After spending so much time at The Bellamy-Ferriday House and Gardens researching Lilac Girls, you can imagine how attached I’ve become to the lovely old house. I’ve also become so fond of the wonderful people at The Connecticut Landmarks, in whose hands Caroline left her beloved home. 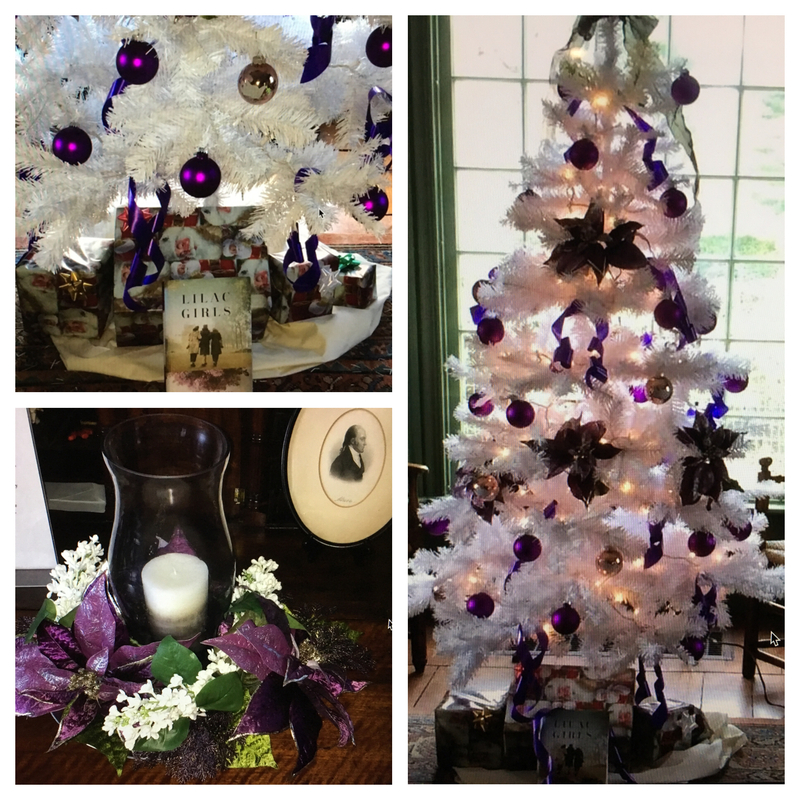 This year they have done a holiday tribute to Lilac Girls and decked the halls with lilac poinsettias and even put the book under the tree. I’m just so touched and this holiday I’ll be thanking my lucky stars I visited Caroline’s home back in 2000. Dressed in lilac, The Hay has never looked more beautiful. Thank you to Dorothy Ambruso, BF House guide extraordinaire for sharing it. I’ve just finished reading your compelling and sensitively and atmospherically written book! Its my pleasure, Karen. I’m so glad you enjoyed Lilac Girls and that you found it to be a good companion on your trip! I have just completed my reading of your beautifully written novel. I found it impossible to put down, each chapter drawing me in more to the characters’ world. It is heartwrenching to know of the pain human beings can be capable of inflicting on others but uplifting to reflect on the courage, faith, and tenacity of the human spirit. I cannot wait to share your work with my friends. When my lilacs bloom in the spring, I will remember your Lilac Girls. Notes like this make me especially glad I wrote Lilac Girls. Thank you! Thank you, thank you, thank you! Just by reading the inside cover of the book I was hooked. Without knowing anything about Caroline Ferriday and knowing very little about the Ravensbrucks Lapins previous to the book, I have now read numerous articles and first hand accounts on both, all of which tell an incredible story of adversity and survival. While somewhat unbelievable to comprehend what humans are truly capable of, it is also amazing to see the humanity that can exist in us all. Thank you for bringing to life such an emotional story; a story that needed to be told. Thank you, Jennifer. I’m so happy you enjoyed it! I couldn’t have said it better! Ditto to it all! Thank you so much for all your hard work writing this book! It was so good and I hated to put it down. Some parts were really difficult to read; it is amazing what people are able to survive. I was surprised the woman Doctor stayed at the camp as appalled as she was when she first got to Ravenbruk. I am glad also that she wasn’t allowed to get away with all of what she had done, though she must have thought she had for many years. I hope you are writing another book. I will look forward to reading it! Thank you again! You have a loyal fan in me. What a sweet note, Paulette. So glad you enjoyed Lilac Girls! I’m working on the next book now,a prequel to Lilac Girls. Can’t wait to share it! ? I have just finished reading Lilac Girls. It was a story that was beautifully written. It inspired me to learn more about the people you wrote about. This story of courage and strength. I am an avid reader and there is only one other author I have ever felt the need to write about… now you make two! I am looking forward to your next endeavor. Again, thank you so much for a great novel about a very sad time, but with such a hopeful ending. Happy New Year! Wow, Mary, just one of two. I am honored and just thrilled that you reached out. I am so glad that I discovered Lilac Girls and I thank you for the enormous research task that you undertook in writing this novel. I was a little afraid that I wouldn’t be able to abide what I expected to be the gruesome parts, but the characters maintained so much sensitivity and even kindness toward each other that I anticipated reading more to the saga. There are so many fragments that stick in my mind – fixing an inmates hair for her, sharing the delicacy of a carrot and clueless Herta assuming the psychologist didn’t wear a lab coat solely in order to woo them to trust him. I wish I lived near enough to attend one of your book talks and I look forward to your future novels. Oh, and thank you for giving us a glimpse of the real women who inspired your work. Thank you for your note, Georgette. I love hearing specific things readers like in the book. We share a lot of the same likes…especially the one when Kasia and the other women fix Regina’s hair for her. All based on true accounts, which makes it even more poignant. Really appreciate you taking the time to reach out! Just finished reading your book, I can’t begin to tell you how much I loved the book. Growing up some of my neighbor survive the camps, they never talked about it, but sometimes you just knew they were back there. Thank you again for the book, their stories need to be told. Your book is making rounds in our Bridge Club, everyone who has read it loved it and the others are patiently waiting to read. So happy it’s making the rounds of the bridge club, Annette! I picked up your book at our public library because it looked like an interesting read. When I read that Carolina Ferriday’s grandmother was Eliza Woolsey, I was shocked. My family has a number of letters written during The War Between The States, between my great, great grandmother, Leah Rauch Chandler, and her husband, James Chandler Ramage. Mrs. Chandler also had three brothers who fought during that war. Mrs. Chandler’s brothers, Henry Rauch and Sam Rauch were wounded during the Gettysburg battle and were taken to the Sanitation Hospital. Sam Rauch’s wounds were treated and he was taken to prison. Henry, however, died during the night. Mrs. Eliza Woolsey, fearing that his family may not know about his death, wrote to whom she thought was Henry’s father, but was his older brother. We have a copy of that letter which shows her great tenderness and concern regarding her work with the Sanitation Committee along with her daughter who helped. Would you be interested in seeing a copy; if so, I’ll be happy to send it to you via snail mail or email. What a wonderful coincidence that you just happened to pick up Lilac Girls! Thank you for reaching out…I would love to see a copy of your letter! As you can imagine I am incredibly interested in everything about the Woolseys. So appreciate your offer! My email is marthakelly10@gmail.com if you can send it by email. I’m so happy you enjoyed the book, Marsha. I think women with sisters really relate to the bond Kasia and Zuzanna share–one of my favorite parts of the book! Hi Agnes, If you go to my website at marthahallkelly.com to the book clubs page you will find a list of discussion questions. There is also one in the back of the paperback. Have a great meeting! Dear Mrs. Kelly, I loved your book! 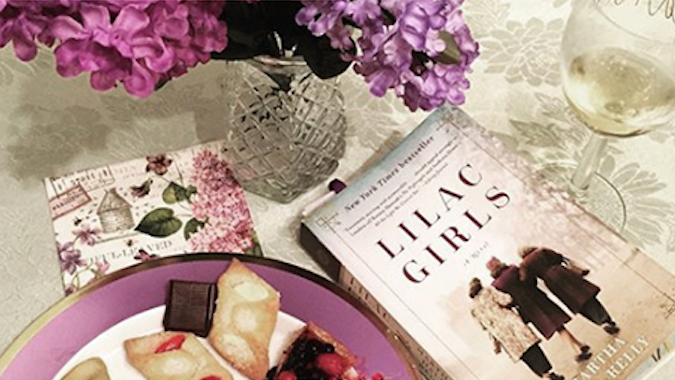 My book club is meeting on Wednesday to discuss the Lilac Girls. Could you send me some discussion questions I could use. I could use some help! Thanking you in advance! Hi Agnes, So glad you enjoyed Lilac Girls! If you go on my website marthahallkelly.com you will find discussion questions on the book club page. Started Lilac Girls yesterday and finished it tonight. It was compelling and very informative. I’m going to recommend it to my book club. I hope to see you in June in Bethlehem, CT.
P.S. I am your fan who was born on Easter (April 13, 1941). What a joy it was reading Lilac Girls. I am NOT a avid reader, but prior to leaving for a beach vacation, I decided to look for a book while relaxing to read. I could not put it down. Even my friends who know me joked that i was actually finishing a book. Thank you for telling this heart wrenching story, which is so beautifully written. I look forward to the prequels. So glad you enjoyed it, Wendy. Makes me happy to hear it! Thank you for writing such a great novel and capturing so many details like Kasias teacher giving out candy “krowka” to her students. My mom still mails me “krowka.” My mother currently lives in Poland. I was born and raised in Poland and came to the USA when I was 19 years old. Being in this country for 26 years I met so many people like Caroline with a great, caring, and loving heart to do anything to help others in need. I’m looking forward your new book, good luck. You are so welcome, Agnieszka. I’m so glad the book resonated with you! Next postBe Still My Heart. Lilac Girls Paperback Just Arrived.